The piece is part of a University of Denver Law Review special issue on “Obama Phenomena.” Williams argues "that the gender and racial norms contributing to the traditional notion of First Lady exemplify the intertwined nature of racism and sexism, and particularly how they have been used to justify Black subordination.” It also explores the “transformative potential” of Mrs. Obama’s presence in this role. (Williams notes that Obama prefers the honorific “Mrs.”). We’ve all heard more than enough about the faux “fashionista wars” between Mrs. Obama and France's First Lady, Carla Bruni-Sarkozy (a professional fashion model). Still, it is difficult not to be pleased by the cross-cultural acknowledgements of physical health, discipline, beauty, and grace in a prominent African-American woman. Stereotypes about Black women have been so often thoroughly derogatory. The fact that a woman of color could be a global trend-setter is too rare a thing to reject. Television now even embraces at least one “Black woman as fashion trendsetter” in the post-feminist person of fictional (and thoroughly ruthless) fashion power broker “Wilhelmina Slater” (played by actor Vanessa L. Williams on “Ugly Betty”). But fashion trendsetting is only one form of power—and a particularly gendered one. Michelle Obama was an attorney for a multinational law firm and an administrator for a major university medical center. She is a committed mother and family member. She has strong ideas about health, education, the rights of women workers, and the work/family balance. (See White House profile here.) That's as it should be. We are, after all, approaching the 30th anniversary of the adoption of the Convention on the Elimination of All Forms of Discrimination Against Women (and still awaiting ratification by the United States). As Verna Williams notes, however, we in the U.S. and outside it remain profoundly ambivalent about the role(s) of First Ladies. They are unelected and therefore should not exercise presidential powers. Yet they are often the closest advisers to presidents. They have always brought their own intellectual, political, social, and personal perspectives to Washington and beyond. 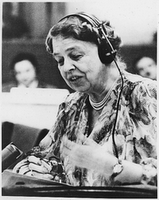 The first UN Commission on Human Rights Chairperson Eleanor Roosevelt (below right) is a case in point, given her domestic and international advocacy. (photo credit) (Click here for posts by Beth Van Schaack and other IntLawGrrls on Ms. Roosevelt.) Historians reveal that the subtle or overt influence of First Ladies on presidential decision-making stretches back to the nation's founding and did not end with now Secretary of State Hillary Clinton (left) and former First Lady Laura Bush. These responsibilities, substantive and stylistic in nature, also carry the mark of traditional domesticity, and the gendered expectations that comprise it. Namely, the primary focus of the First Lady’s role is on the private sphere—that is, the home and family. Paramount among her duties is supporting her spouse at home so that he may succeed in the public sphere. For First Ladies, the simplest gestures are fraught with social, cultural, and economic meanings. For example, many African-American observers, including me, found the sight of Michelle Obama jumping “double-dutch” (a complicated form of rope-jumping) at a White House "Healthy Kids Fair" to be a wonderful moment. None of us thought we’d ever see what we might have thought of as a Black "girls' game” being played at the White House. That game is now considered a sport, and requires significant physical stamina, balance, hand-eye coordination, and skill to perfect. (A virtuoso performance at the World Double-Dutch Championship is linked here.) Such symbols indicate that positive African-American and historically gender-linked traditions can represent an “American” tradition as well. The more significant transformative potential of this “First Black Lady” status is yet to be seen (as will the potential of a future first “First Gentleman”). But I suspect it will be fulfilled by observers of the White House, not those inside it. It will be evident when we are prepared to assess presidential partners for who they are, not who we imagine them to be. Thanks to Alexis Smith for her research assistance. ... 67 percent of bloggers are men—up a little from the year before. That's a worse gender imbalance than in American newsrooms, which is saying something. -- Mother Jones' Marian Wang (left), in "Where Are All the Lady Bloggers?" ... 1945, India was admitted to membership in the United Nations. The milestone was achieved 6 days after the U.N. Charter entered into force (prior post), and 2 years before the country attained full independence from its colonizer, Britain (prior post). So reads an article in today's NY Times about Chilean President Michelle Bachelet's successes in office. (See previous IntLawGrrls posts on Bachelet here.) That "feminine nature" includes a long-term financial strategy according to which she set aside billions of dollars from Chile's copper boom, a move that enabled her country to recover quickly from the global financial crisis. Her government has legalized alimony payments to divorced women, tripled the number of free early child-care centers for poor families, and created a minimum pension guarantee for poor homemakers and the very poor. (Go On! is an occasional item on symposia and other events of interest) Public opinion on international law and on The Hague-based International Court of Justice, as revealed in a 21-country poll, will be the subject of a discussion from 4-5:30 p.m. Tuesday, November 3, at Tillar House, the headquarters of the American Society of International Law, 2223 Massachusetts Avenue, N.W., Washington, D.C.
ASIL's cosponsoring the event along with WorldPublicOpinion.org, whose Director, Steven Kull, will present the findings from a survey from a variety of locations, including Britain, China, Egypt, France, Germany, India, Indonesia, Iraq, Kenya, Nigeria, Pakistan, Palestine, Russia, and the United States. ASIL Executive Director Elizabeth Andersen will moderate a panel of discussants on the results. Among the questions to be explored include many on which IntLawGrrls frequently post, such as: the desirability (or not) of compliance with international law; confidence (or not) in the ICJ; the role of the United Nations; intervention under the banner of responsibility to protect or for other reasons; and the International Criminal Court indictment of Sudanese President Omar al-Bashir. Details and registration for the free event are here. Military Commissions Act of 2009: New AND Improved? Congress passed several amendments to the Military Commissions Act last Thursday, as part of the National Defense Authorization Act for Fiscal Year 2010. President Barack Obama signed the legislation yesterday. An earlier version of this post stated that "There is much of importance — some good, some less good — in this legislation." That post went on to focus on the war crimes provisions of the MCA in light of our prior posts on this topic (see, e.g., here and here) (Others have discussed some of the procedural aspects governing the use of coerced confessions and the applicability of Miranda warnings or the collateral review aspects). Unfortunately, the earlier post was based on a prior version of the legislation that did not ultimately get passed. As a result, there is less good in the new legislation as I detail below. (a) Purpose. This chapter establishes procedures governing the use of military commissions to try alien unlawful enemy combatants engaged in hostilities against the United States for violations of the law of war and other offenses triable by military commission. (a) Purpose. This chapter establishes procedures governing the use of military commissions to try alien unprivileged enemy belligerents for violations of the law of war and other offenses triable by military commission. (C) is a member of al Qaeda. This definition adds to our genealogy of efforts to define who may be detained and prosecuted in the post-9/11 era. (f) Status of commissions under common Article 3. A military commission established under this chapter is a regularly constituted court, affording all the necessary "judicial guarantees which are recognized as indispensable by civilized peoples" for purposes of common Article 3 of the Geneva Conventions. In deleting this language, Congress acknowledged that it is the courts that will decide whether such commissions meet U.S. constitutional and international law obligations and that simply saying something is so does not make it so. (a) PURPOSE.—The provisions of this subchapter codify offenses that have traditionally been triable by military commissions. This chapter does not establish new crimes that did not exist before its enactment, but rather codifies those crimes for trial by military commission. (b) EFFECT.—Because the provisions of this subchapter (including provisions that incorporate definitions in other provisions of law) are declarative of existing law, they do not preclude trial for crimes that occurred before the date of the enactment of this chapter. (d) Offenses Encompassed Under Law of War—To the extent that the provisions of this subchapter codify offenses that have traditionally been triable under the law of war or otherwise triable by military commission, this subchapter does not preclude trial for offenses that occurred before the date of the enactment of the National Defense Authorization Act for Fiscal Year 2010. This language, which acknowledges that just because Congress says something was already penalized by the law of war does not make it so, unfortunately did not make it into the final legislation. New Section 950p(d) has the same effect as the language in the 2006 MCA. (g) Geneva Conventions not establishing source of rights. No alien unlawful enemy combatant subject to trial by military commission under this chapter may invoke the Geneva Conventions as a source of rights. (e) Geneva Conventions Not Establishing Private Right of Action—No alien unprivileged enemy belligerent subject to trial by military commission under this chapter may invoke the Geneva Conventions as a basis for a private right of action. Thus, while the original provision purported to bar any invocation of the Geneva Conventions, the new language accepts that the Conventions may be applicable offensively in habeas proceedings or defensively in penal proceedings by providing only that they may not give rise to an independent cause of action. ►Fifth (bad), conspiracy (the charge of choice before military commissions) is still listed as a substantive crime. In the rejected draft version of the legislation, conspiracy appeared only as a form of responsibility applicable to all the enumerated offenses along with attempt, solicitation, superior responsibility, accessoryship, etc. This change was not adopted, and so the new MCA still allows for the prosecution of an inchoate crime of conspiracy, notwithstanding that a plurality of the Supreme Court in Hamdan determined that no such crime exists under the law of war. Had the draft language been adopted, conspiracies would have been prosecutable only as a form of responsibility when some substantive war crime that was the object of the conspiracy was committed. (c) Common Circumstances—An offense specified in this subchapter is triable by military commission under this chapter only if the offense is committed in the context of and associated with armed conflict. Incidentally, the formulation of the war nexus is identical to that in the ICC's Elements of Crimes. Any person subject to this chapter who, in violation of the law of war and with intent or reason to believe that it is to be used to the injury of the United States or to the advantage of a foreign power, collects or attempts to collect information by clandestine means or while acting under false pretenses, for the purpose of conveying such information to an enemy of the United States, or one of the co-belligerents of the enemy, shall be punished by death or such other punishment as a military commission under this chapter may direct. rather the leaving the task of determining their cognizability to the commissions (and the courts if they're allowed to get their hands on these cases). Had the crime of conspiracy actually been deleted as was obviously contemplated, many of the existing military commission cases would have had to be re-worked in light of the heavy reliance on that charge. It's IntLawGrrls' great pleasure to welcome Pamela Yates (right) as today's guest blogger. 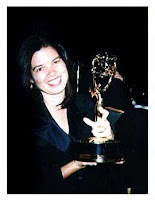 Pamela's a cofounder of Skylight Pictures, Inc., and the director of Skylight's most recent production: The Reckoning, a feature-length film on the International Criminal Court that's subject of IntLawGrrls posts posted here and here by Lucy Reed and yours truly. Recipient of a 2008 Guggenheim Fellowship and a member of the Director’s Guild of America and the Writers Guild of America, Pamela has been involved in many film projects in addition to The Reckoning. Examples: producer, Loss of Innocence, winner of an Emmy; director, When the Mountains Tremble, winner of a Sundance award; Executive Producer, Witness to War, winner of an Academy Award; director, State of Fear (2005) (below left), which relied on findings of the Peruvian Truth and Reconciliation Commission to depict the counterterrorism campaign that lasted 2 decades in Peru; director, Presumed Guilty, a PBS special about public defenders in San Francisco; producer, director, and co-author, Cause for Murder, about the lives and deaths of 2 young Mexican lawyers; producer and director, Brotherhood of Hate, about violent white supremacy movements; and producer and director with Skylight colleague Peter Kinoy of Living Broke in Boom Times, a trilogy about poor peoples’ movements in America. In addition to all these achievements, Pamela directed what is thought to be the first music video made in China. No More Disguises, featuring troubajor Ciu Jian, filmed in Tianamen Square at the dawn of the democracy movement, was named by Rolling Stone as one of the 10 best music videos of 1989 and had its U.S. premiere at the New York Film Festival’s opening night. In her guest post below, Pamela reports on IJCentral, the online global social network on through which she and her colleagues continue to rally their audience 'round the cause of international justice. 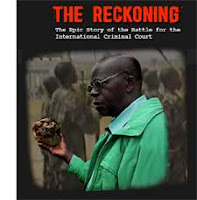 Making the film The Reckoning: The Battle for the International Criminal Court wasn’t enough. There had to be a way to take the members of a general audience, newly introduced to the idea of the International Criminal Court via the emotional journey in the film, and make them part of a growing movement for international justice. ► What do we want people to do afterwards? ► How can we make our films engage, educate and increase understanding of human rights amongst the public at large and policy makers, contributing to informed decisions on issues of social change and the public good? The Reckoning film, on which IntLawGrrls posted here and here, is the flagship in a 3-year outreach campaign and educational initiative meant to drive new constituents to the international justice movement. (You can join the 10,000 others who've already taken advantage of free online viewing here, and/or purchase the and DVD here.) As a complement, we've created a place that these new audiences can go to after seeing the film: IJCentral, an information resource and social network for global justice. Depicted at the top of this post, the IJCentral site was launched at the world premiere of The Reckoning during the 2009 Sundance Film Festival this past January. 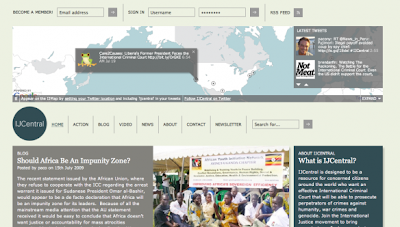 Today the site joins IntLawGrrls' "connections..." list in the column at right. IJCentral implements a multi-platform citizen engagement strategy, using online mapping technology to visualize a global social network for international justice. It aggregates blogs, videos, SMS text messaging, media modules created from The Reckoning footage, Twitter and Facebook, e-mail listserve groups, news feeds, and photo feeds, taking advantage of a range of Web 2.0 social bookmarking applications available online. Making use of mobile phones, the world’s most widely distributed communications platform, Twitter and FrontlineSMS text-messaging technology is incorporated into the map. This allows activists, victims, educators, students and other members of the network to upload SMS text messages to the map -- already, you can see a global conversation about justice appears as geo-located pop-ups on that map. IJCentral is a work in progress, with constant improvements in access, reach, and innovation. As it accumulates content from users, IJCentral will become an invaluable resource and database for human rights advocates and international justice activists around the world. An array of strategic stakeholder partners with worldwide reach will be accessible through IJCentral, including the Coalition for the International Criminal Court, the umbrella for 2,500 NGOs non-governmental organizations around the world actively working to achieve universal ratification of the ICC, and the American Society of International Law. ► Multiple language versions of The Reckoning. We now have English, French, Spanish, and Portuguese. Depending on our fundraising efforts, Swahili, Arabic, Luo, and Russian are next. ► In-depth educational modules for classroom use, each 10 to 15 minutes in length. The first 3 modules, produced with Facing History and Ourselves are “The Creation of the ICC,” “Peace and Justice” (as played out in Uganda), and “The ICC and Darfur” (the problem of enforcement). ► Micro-docs, 3-minute shorts that bring the role of the victim into places where victims might not be able to go themselves, such as international justice conferences. ... 1919 (90 years ago today), Congress paved the way for Prohibition by passing the Volstead Act. The statute authorized enforcement of the 18th Amendment, which would take effect in 9 months and ban the U.S. sale, manufacture, or transport of alcoholic beverages -- that is, until its repeal in 1933. This Library of Congress site notes linkages between temperance and suffrage movements. 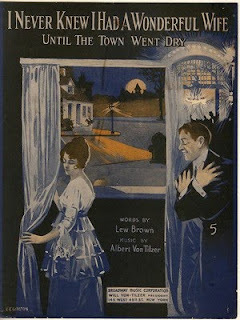 The 1919 sheet music illustration at right (credit) depicts a reason for that linkage: drinking was condemned as a scourge on family life. I'd rather see myself played by a Puerto Rican or an Italian with a tan than have them ruin the basketballness of me. 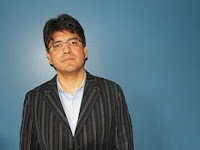 -- Sherman Alexie (right), author of works this IntLawGrrl much admires, on why, according to this article in The New York Times, "[h]e turned down offers to sell the movie rights to" his young-adult novel The Absolutely True Diary of a Part-Time Indian (2007), "a book he calls an extremely faithful recounting of his experience growing up poor on the Spokane tribal reservation in eastern Washington State." In the few words of the quoted sentence, Alexie speaks volumes about the complexities of assigned and self-perceived identities. ... 1932, Sylvia Plath (left) was born in Jamaica Plain, Massachusetts. A creative spirit was evident early on, both in painting and in poetry -- she published her 1st poem at age 8. Her years at Smith College and summer internship at Mademoiselle magazine, a period that included a suicide attempt, provided material for her 1st novel, The Bell Jar. Plath lived and wrote poetry in the United States and Britain, birthplace of her husband, poet Ted Hughes. 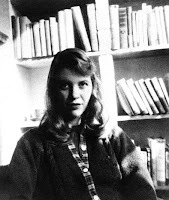 At age 31 Plath died in London, a suicide, on February 11, 1963. (Occasional sobering thoughts.) Recent news has focused on Hamid Karzai, Afghanistan's incumbent President, who acceded to a November 7 runoff to decide an election contest tainted by charges of massive vote fraud in the 1st round, held back in August. Karzai's opponent, Abdullah Abdullah, "is considering boycotting the upcoming runoff if his demands are not met to remove the leaders of Afghanistan's election commission who he believes are biased against him," according to the latest Washington Post dispatch. Hinging on this controversy is not only the political future of Afghanistan, but also the next move respecting troops from the United States and the NATO coalition it has forged in Afghanistan. Also in the news was Pakistan, where more than 100,000 civilians have been fleeing government counterattacks on militant strongholds, according to a Canadian Broadcasting Co. report. For the second time in two months, two synchronized suicide car bombings struck at the heart of the Iraqi government, severely damaging the Justice Ministry and provincial council complexes in Baghdad on Sunday, killing at least 132 people and raising new questions about the government’s ability to secure its most vital operations. 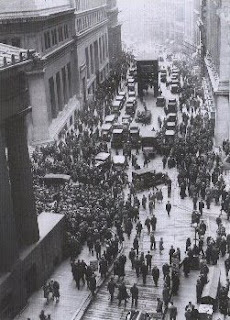 The bombers apparently passed through multiple security checkpoints before detonating their vehicles within a minute of each other, leaving the dead and more than 520 wounded strewn across crowded downtown streets. ► Respecting the conflict in Afghanistan, our DoD websource appears to be using a new counting method. It reports that military casualties in Afghanistan stand at 886 Americans, 222 Britons, and 361 other coalition servicemembers. The site includes a number of new charts, including places where death occurred "in and around Afghanistan," deaths from improvised explosive devices, or IEDs, and the pie chart above, which depicted countries from which fallen servicemembers hailed. The total servicemember casualty count in the Afghanistan conflict is 1,469. It's IntLawGrrls' great pleasure to welcome Dr. Alice Edwards (right) as today's guest blogger. Alice, about whose scholarship IntLawGrrl Jaya Ramji-Nogales has posted, is Lecturer in International Refugee and Human Rights Law at the Refugee Studies Centre at Oxford University in England; she's also a member of Oxford's Faculty of Law. Previously she was Lecturer in British Human Rights Law at the University of Nottingham. She is a past recipient of an Arthur C. Helton Fellowship of the American Society of International Law and winner of the 2008 Audre Rapoport Prize for Scholarship in the Human Rights of Women from the University of Texas. She is author of over 20 articles on displacement and refugees, human rights, and women’s rights/feminist theory, including a forthcoming collection entitled Human Security and Noncitizens (Cambridge University Press), co-edited with Redress Director Carla Ferstman. Alice completed her PhD in 2008 from the Australian National University under the supervision of IntLawGrrl guest/alumna Hilary Charlesworth. Cambridge is scheduled to publish her dissertation in 2010, as Violence against Women and International Human Rights Law: Not Yet Equal. Prior to joining the academy full-time, Alice worked for the U.N. High Commissioner for Refugees, serving in Bosnia and Herzegovina, Rwanda, Morocco, and at HQ in Geneva; for the International Secretariat of Amnesty International in London; and for Food for the Hungry International in Mozambique. 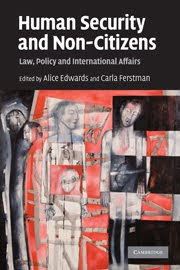 In her guest post below, Alice comments on recommendations, contained in the just-released National Human Rights Consultation Report, for improving the legal framework of human rights protection in Australia. She dedicates her post to feminist/humanitarian Rosamond Carr, for the reasons detailed in her further guest post below. Carr joins other foremothers in the list just below our "visiting from..." map at right. 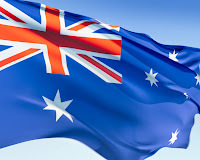 After an extensive Australia-wide human rights consultation, a respected government-constituted Committee has recommended, in its National Human Rights Consultation Report, that the time has come for an Australian Human Rights Act. The key question demanded of the consultation committee was whether Australia should (and in some ways whether it is ready to) adopt human rights legislation. A constitutional bill of rights equivalent to the US Bill of Rights was regrettably off the table from the start, as such a proposal fell outside the consultation’s terms of reference. Despite this, even if an ordinary piece of legislation is adopted on human rights, it would represent a dramatic change in human rights protection in Australia. At one time a world leader in its commitment to human rights, Australia has fallen behind comparative countries in its systems of human rights protection. It is not widely known that Australia is now the only western liberal democracy without a “Bill of Rights” (broadly defined). The lack of national protection, and a human rights-shy High Court, have permitted successive Australian governments to introduce laws, such as for indefinite detention, immigration restrictions and indigenous discrimination, despite widespread criticism that they violate international law. The National Human Rights Consultation Committee, led by Father Frank Brennan, a highly regarded Jesuit priest, received 35,000 submissions and hosted 66 roundtables in 52 different locations throughout Australia. It was a grassroots effort of consultation spanning the entire geographical continent, reaching out to many mainstream, as well as isolated, communities. In this vein, the Committee’s first recommendation is that efforts be taken to build a human rights culture in Australia through education as a number one priority. ► Require federal public authorities to act compatibly with rights and give proper consideration to human rights in decision making (the proposal did not settle on what to do about state public authorities and left open various options). ► Require a Joint Committee on Human Rights to review all legislation for compliance with human rights. ► Provide an effective remedy, including damages, to people who have suffered a breach of civil and political rights (although not their economic, social and cultural rights,even though the latter also would be listed in the Act). ► Contain a list of what could be described as “citizen responsibilities,” such as a duty to vote (which is already compulsory in Australia), to serve on a jury when required, to show respect for diversity and equality, including special respect for indigenous Australians, and to hold governments to account for acting unlawfully. It was left unclear what legal effect these responsibilities would have on one’s rights. No doubt any proposed model was bound to leave many technical questions to be answered, not least those arising from the federal nature of Australia’s constitutional system, or the compromises taken and the merging of foreign models into a single Act. One other problem that still lingers, too, is that the Human Rights Act will be just an ordinary statute and, therefore, liable to repeal by subsequent governments who find it unworkable, or potentially inadvertently by implied repeal. The Australian constitutional system has not yet established a system of “constitutional statutes” as in the UK. The House of Lords (now the UK Supreme Court) has found that some UK statutes are of particular “constitutional significance” that they are held not to be subject to the doctrine of “implied repeal” (per Thorburn v Sunderland City Council (2002) All ER 156). This is largely driven by the fact that the UK does not have a written constitution, and makes this ”class of statutes” harder for Parliament to override – they must do so expressly. The Australian government has promised to respond to the report in the coming months. Despite the challenges ahead, if a Human Rights Act is pursued by the Labor government of Prime Minister Kevin Rudd, and adopted by Parliament, it would represent a dramatic and welcome change in the Australian constitutional landscape and an important victory for human rights. Rosamond Carr, with whom I'm pictured a right, was a wonderful feminist in her own way, a real humanitarian, mother of Rwanda’s orphans, and a good friend to me. Having started out life in New York as a fashion design hopeful, New Jersey-born Rosamond moved to the Belgian Congo after having married British “big game hunter and filmmaker” Kenneth Carr. He was 24 years her senior -- although she shared with me that she had not known that he was so much older than her when they married. A few years into the marriage, it foundered. But by then, it seems, Rosamond had fallen in love with Africa, and instead of fleeing back to the States, she bought a farm in Rwanda, growing flowers for hotels, businesses and embassies in Kigali and living modestly. It was at this time that she started raising money to send young Rwandans to school and university, many of them the children of her farm workers. She never married again, nor had any children of her own. Rosamund's life became intertwined with another amazing woman -- and IntLawGrrls foremother --the zoologist Dian Fossey. Rosamond always spoke fondly and vividly about Fossey if you’d ask her. Identified in the Fossey film biography Gorillas in the Mist (1988) as "Roz Carr," Rosamond is portrayed by actress Julie Harris. Rosamund refused to leave her home and her staff during the April 1994 genocide in Rwanda. Her farm was in the foothills of the Virunga mountains, close to some of the worst slaughter and fighting in the country. Eventually she was evacuated and many of her staff and friends were killed, but she returned in August the same year to turn her own pyrethrum-drying plant into the Imbabazi Orphanage for children who had lost their parents in the genocide. She was still running the orphanage when I met her in 2000-2001, when we became neighbours in the lakeside village of Gisenyi, on the Congo border. I was there working for the U.N. High Commissioner for Refugees. Though she turned 90 during that time, Rosamond incredibly active for her age. She was generous to a fault, and her beautiful garden was a real sanctuary from what was still difficult Rwandan politics at that time. We corresponded by old-fashioned letter until she died in 2006, aged 94. Her life is portrayed her memoir, Land of a Thousand Hills: My Life in Rwanda (1999), co-authored with her niece, Ann Howard Halsey. 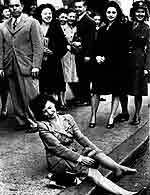 Rosamond's selflessness inspires me to this day. ... 1980, delegates to the 14th Session of the States Members of the Hague Conference on Private International Law concluded the Hague Convention on the Civil Aspects of International Child Abduction, "a multilateral treaty, which seeks to protect children from the harmful effects of abduction and retention across international boundaries by providing a procedure to bring about their prompt return." The treaty, which entered into force in 1983, now has 81 states parties. The early 1970s was a limiting time for women, but it was also, perhaps, a hopeful time. There was definitely a feeling in the air that women’s lives were changing in a positive way. There was a sense that everything was possible, that life for women was getting better, that if things hadn’t yet come together as well as they should have, they inevitably would. Down the line. Like, today. Life for women has not come together. This weekend is the University of Connecticut's Human Rights in the USA conference. So far, the proceedings have been fascinating. 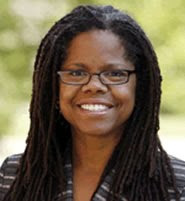 Dorothy Q. Thomas gave the Sackler Distinguished Lecture in Human Rights. Panels today address the relationship between human rights and environmental rights (at which I spoke, along with Joanne Bauer, Elizabeth Burleson and James Nickel), criminal punishment, poverty, health care, children, and many other topics. Tomorrow's panels look equally interesting. Yesterday, the United Nations International Fund for Agricultural Development (IFAD) released a report on remittances to Africa. The report notes that the 30 million members of the African diaspora abroad contribute annually approximately $40 billion in remittances -- a number that far exceeds official development assistance for the region as a whole and that is greater than foreign direct investment for many countries. As a result, "[p]articularly in these times of financial turmoil, workers’ remittances are being recognized for their contribution to the economic health of the region’s nations, as well as for their vital importance to recipient families." In the interest of increasing the development impact of these remittances, IFAD examines the competitiveness and regulation of as well as access to African remittance markets. The picture is not pretty: two major money transfer companies control 65 percent of all remittance payout locations, and these companies require that agents sign exclusivity agreements, creating serious barriers to market entry. Moreover, 80 percent of African countries allow only banks and foreign exchange bureaus to offer remittance services. As a result, microfinance institutions, which may be better located and structured to serve rural and less wealthy customers, constitute less than 3 percent of remittance payers. IFAD cautions that a regulatory fix alone will be insufficient to jump-start microfinance; most of these institutions currently lack capacity and will need significant technical assistance in order to offer remittance services that will maximize development impact. Average monthly income excluding remittances is significantly higher for men (US$195) than for women (US$175). Interestingly, when the receiving of remittances is included, women have a slightly higher monthly income (US$226) than male remittance recipients (US$218). Among non-recipients, men have significantly higher monthly incomes (US$195 versus US$164 for women). Moreover, female remittance recipients have, on average, 2.5 times the savings of non-recipients. 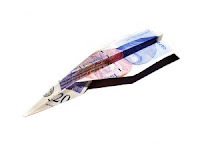 Lowering the cost and increasing the development impact of remittances seems an uncontroversially desirable goal. To that end, IFAD recommends more regular study of remittances to Africa; reforming regulation to encourage competition in services, including by supporting microfinance institutions; and building capacity by providing technical assistance to microfinance institutions and financial literacy programs for remittance recipients. These approaches fall squarely within the African Union's mission of sustainable and self-reliant development, and may be promising candidates for regional regulation and coordination. Go On! Human Rights: A Drop of Liberation or Fig Leaf of Legitimation? Newcastle Human Rights Research Group Symposium Announcement: Human Rights – A Drop of Liberation or Fig Leaf of Legitimation? Date: 23 January 2010, Newcastle Law School, Newcastle University, UK. This symposium draws upon the proliferation of academic commentary asserting that the international human rights project is in a state of crisis in the first decade of the twenty-first century, requiring a re-evaluation of both its impact and its future direction. With papers from world-leading authorities on human rights, this symposium provides a forum for assessing the effectiveness of human rights as an element of international law and in the domestic context of the United Kingdom in the face of these renewed and novel challenges. Moreover, this symposium draws together human rights sceptics and supporters from across disparate strands of transatlantic human-rights scholarship. A limited number of places for delegates are available on a first-come-first-served basis, at a cost of £30 per head (or £10 per head for full-time postgraduates), inclusive of lunch and refreshments. Full details of the Conference Programme are available on the Newcastle Law School Website. For further details regarding this symposium, please contact the Symposium Co-ordinators Dr Rob Dickinson (r.a.dickinson@ncl.ac.uk) or Dr Ole W. Pedersen (ole.pedersen@ncl.ac.uk). Payment at the event is possible provided you email to notify your attendance in advance. Please make all cheques for delegate fees payable to Newcastle University and send them to Dr Rob Dickinson, Symposium Co-ordinator, Newcastle Law School, 21-24 Windsor Terrace, Newcastle-upon-Tyne, NE1 7RU. 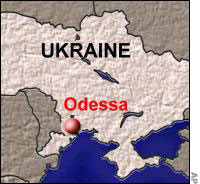 ... 1941, the World War II atrocity known as the Odessa massacre was under way. It had begun the day before and would last another day, and during that time Romanian forces allied with Nazi Germany would kill, by shooting, hanging, or burning, 25,000 to 34,000 Jewish persons from a part of Ukraine including Odessa and neighboring towns. At war's end a number of those responsible would be tried,convicted, and executed; others served terms of imprisonment.